This film is the continuation of the previous one “Strolling under the skin” which has shown a subcutaneous multifibrillar architecture enclosing microvolumes called microvacuoles and which as they are piled up not only ensured the shape but also the mobility, the adaptability and resistance to the gravitational force. The skin, boundary of this optimal efficiency world since it allows life through this fractal and chaotic structure, has not been really studied in its morphodynamic aspect and chiefly in its continuity with the rest of the body. 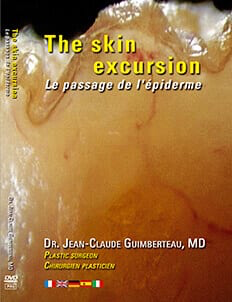 The aim of this film and always thanks to endoscopic observations carried on the living matter, during surgeries to show the existence of mobility mechanism, the architectural organisation in the epidermis, dermis and hypoderm. A vision of the body organisation in complete continuity through this inner architectural, will lead to new reflexions.